Would you like a new Art Deco front door for your property? We design and handcraft completely bespoke front doors in the most popular Art Deco styles. Our Art Deco door designs are thoroughly researched for authenticity and are based on the many originals we have in stock. If you have something particular in mind we are happy to work with you in order to create your perfect door. Our doors are made from the high quality hardwood, hardwaring and perfect for use externally. Browse our range of Art Deco front door designs, available in a number of common sizes. Alternatively request a quote for a fully bespoke Art Deco front door. Below you can view further examples of the Art Deco front doors we have designed and manufactured for customers across the United Kingdom. We can also create Art Deco style stained glass panels when needed. We have a large range of Art Deco designs we have previously made which you can browse for inspiration. You can have any of these designs re-created in your desired colours and sizes, or create one with us. During the 1920’s and 1930’s traditional front doors went through a great transformation. Two new design styles peaked in popularity during these decades which are often referred to as Art Deco and Streamline Moderne. As Art Deco took off doors quickly became modern, fresh and very decorative. This new style could be identified by rich colours, bold geometric shapes and lavish ornamentation. Popular designs such as the ‘sunrise’ first appeared during this period. The door or glass would be shaped to show the rays of the sun. In the late 1930’s, Art Deco doors featured curving forms, long horizontal lines, chrome hardware and porthole windows. A trend finally emerged for lighter and more subdued colours. In addition, large, colourful geometric stained glass designs were used. Art Deco style doors are perfect for traditional period properties and will add a splash of personality into your home. The Arts and Crafts movement during the 1920’s and 1930’s resulted in a resurgence of interest in using stained glass. Doors were being decorated with beautiful glass panels, created by William Morris with floral patterns and designs based on medieval themes. Morris encouraged the art of painting the glass as well as stained glass. Towards the end of the century Art Nouveau became fashionable and the curved shapes were particularly well suited to stained glass designs in Art Deco doors. Many Art Deco front doors would feature large curved or round stained glass panels within the top half of the door. Furthermore stained glass would often be used in the frame around the door. This could be a single glazed widow on either side of the door, or sometimes even both. We offer a large range of fully bespoke stained glass panel designs to suit your door. Most internal Art Deco doors were solid panelled with three central panels. Some contained simple stained glass or regular glass inserts to compliment the entrance, walls and floors. Art Deco door furniture was very decorative. A range of different finishes were used for furniture such as door knobs, door handles, key covers and letterplates. Chrome was a very popular choice for Art Deco period door furniture. House numbers would often be engraved onto overhead glass panels or even the top panel within the door. Additional furniture such as knockers or door bells would add the final lavish touch. We offer a huge range of door furniture and hardware in many finishes and styles to suit your dream door and home decor. 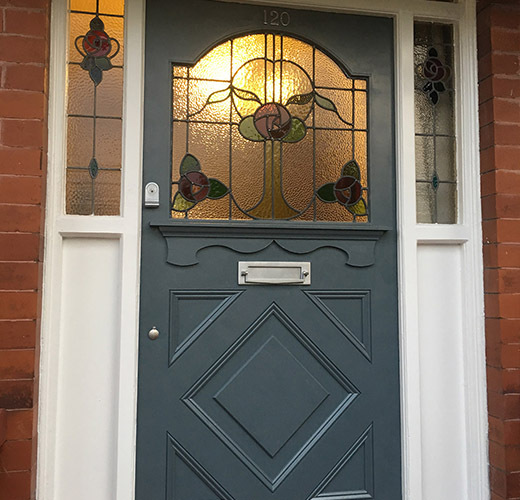 If you’d like a Art Deco front door created to update the look of your home, or if you wish to restore your period property, we can help. Get in touch to discuss your requirements. Take a look at some of the many Art Deco door projects we have completed for our customers over the years.